The first thing I learned when moving from my parents house into my tiny house was the necessity of storage space outside of the home. If you think about it, paying to keep stuff warm that doesn’t need to be warm is silly. Most of my belongings that I don’t use on a day to day basis, don’t need to be stored in a heated house. While I built a fairly amazing amount of storage space into my house, I definitely needed more external storage. Many people laughed at me for converting a 120 sq. 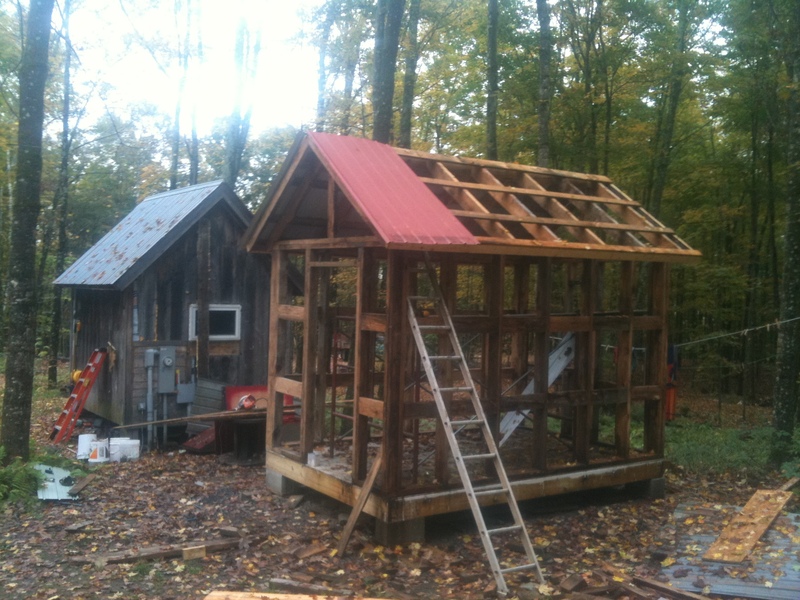 foot tool shed into a house and then building a 96 sq. foot tool shed out back, but C’est La Vie, it made sense at the time. The reason it made sense was timing. I had exactly one year and very little money to get something together to live in because that’s when my parents were vacating their house. It was far too daunting and expensive to start from scratch so I did it the backwards way that made sense to me. I finished my house in time and moved in during the summer of 2011. 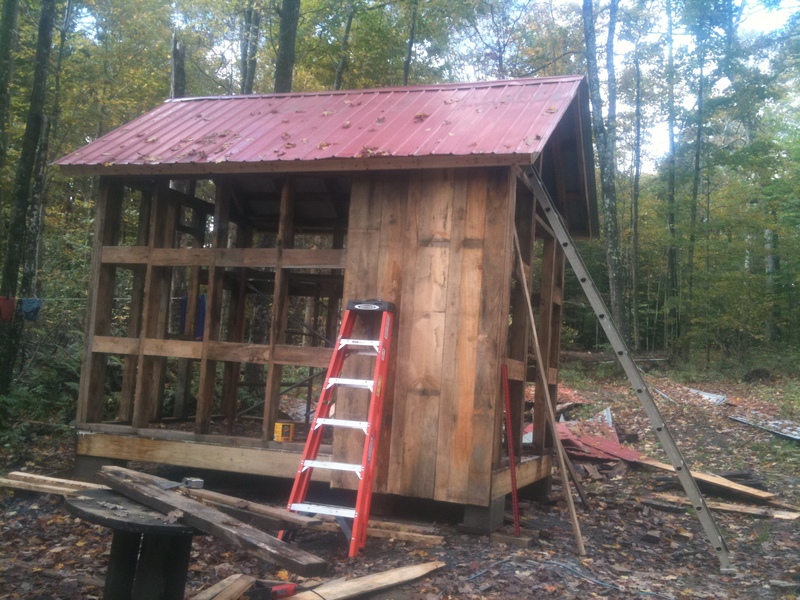 That same summer I built an 8×12 tool shed (the largest size you can build w/out needing a permit). It didn’t take long to fill it up! It now houses my chest freezer where I store local meat and veggies to get me through the year, as well as all my carpentry tools and much of my hiking/camping/skiing/canoeing etc. equipment. 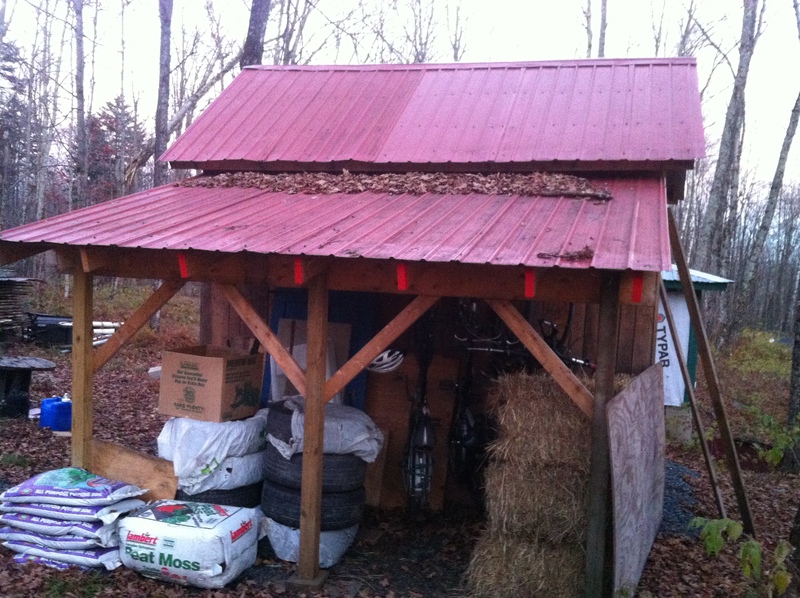 It wasn’t big enough to house all of my bikes as well as all my other gear, so the following summer I build a 6×12 foot shed roof off the back to store my bikes and other large items. 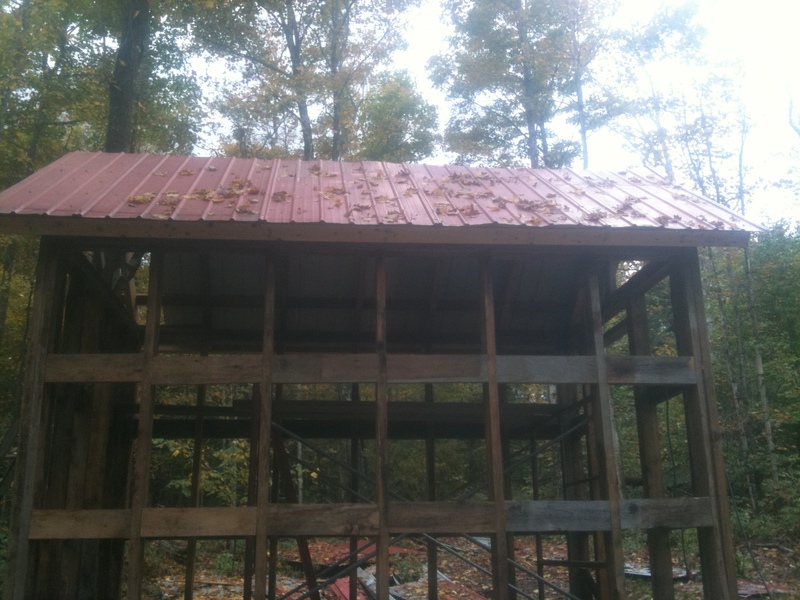 Roof is on! 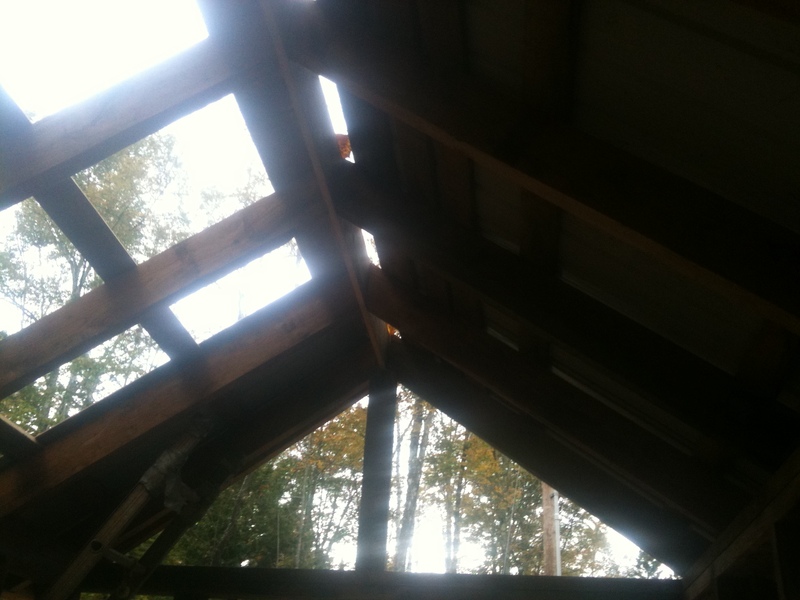 The only new materials I used in the shed were pressure treated 6×6 railroad ties buried in slate as a foundation under each corner, and pressure treated 2×6’s for the floor joists. I used second hand roofing metal I got off a friends house when he had his whole house re-roofed. 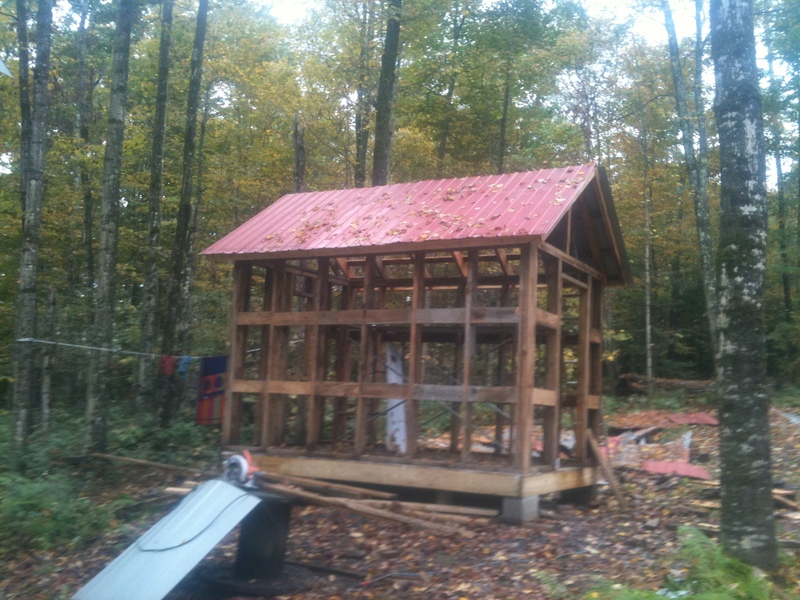 All the wall studs and rafters were 2×4 rough cut sawn on my uncles land and left over from his barn building project. I put wood scrap blocking in between all of the wall studs so I’d have nailing for the rough cut 1 by I used for siding. 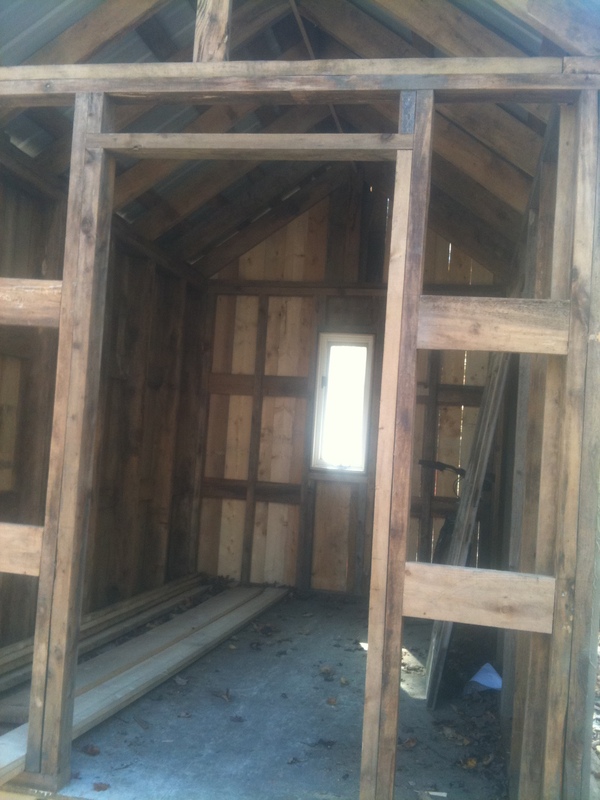 It was also leftovers from my uncles barn project. Siding with rough cut one by left over from my uncles barn building project. 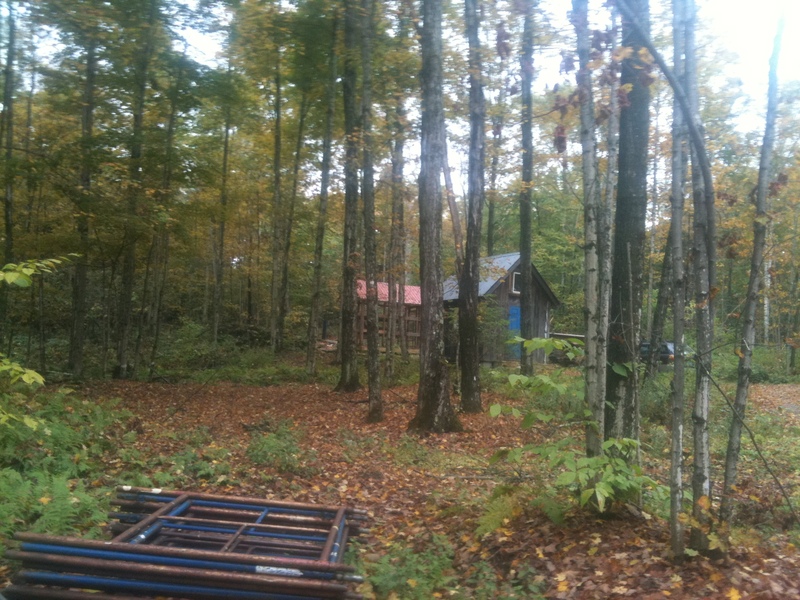 He was generous enough to give me a giant pile of left-over wood that had been cut and milled off of his land. I built the door to fit the antique blue door off my house, but as of yet haven’t hung it! Bikes, gardening tools and supplies, summer/winter tires, hay for covering my compost pile, giant bags of sawdust from he neighborhood furniture maker for my toilet cover material – it’s kind of amazing how much stuff I have around! When I first built the shed I ran an extension cord from my house to the shed so I’d have one drop light for use in the darker hours, but It soon became apparent that it would be nice to have a light or two. 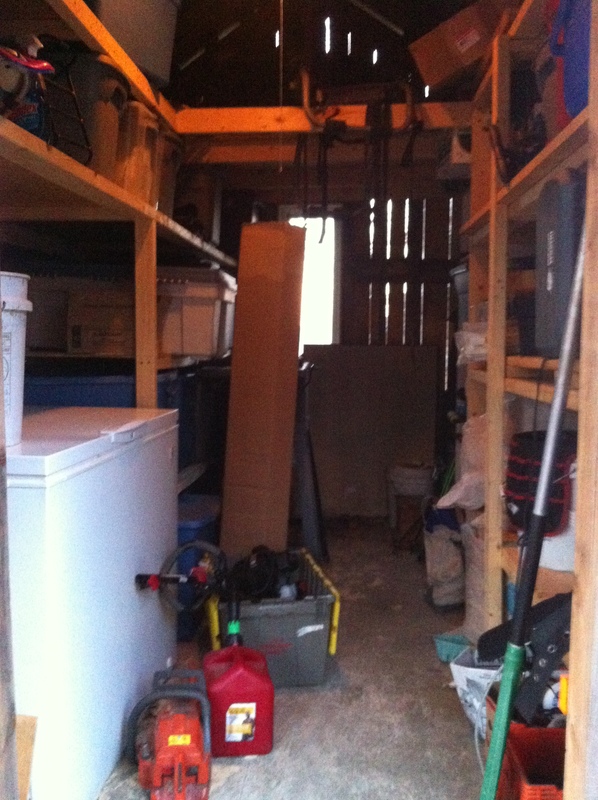 Around the time I decided to invest in a chest freezer I decided I needed something more reliable than an extension cord so I ran a real electric line (wire to meet specs for buried lines) inside a one inch conduit I buried from my house to shed. I didn’t want a line that could get broken by a falling tree limb, and it was short enough distance I was able to dig the trench by hand. A fair amount of work, but not too expensive and worth the labor for the reliability.